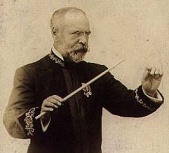 "The season will be opened by John Philip Sousa, the "March King" with his splendidly equipped an disciplined band of 50 musicians, who have just returned from their fourth Trans-Atlantic tour. It will be recalled that last season throughout his engagement thousands upon thousands gathered in and around the music-pavilion before every concert long in advance of the hour for opening...an audience of 50,000 or more people assembled, and in every instance proved that it felt amply rewarded by continual rounds of applause in grateful acknowledgment of the pleasure given. " "Although Victor Herbert is not American born, he has been so intimately identified with the musical life of his adopted country that his Irish birth may be forgiven in the circumstance that he is the greatest composer Ireland has ever sent to us. Now score after score comes from his fertile brain, and the verdict of one successful opera is scarcely rendered before another is proclaimed still better. Side by side with Mr. Herbert's creative genius, is his ever-growing popularity as a conductor and interpreter of the great masters of music. In this role he will again, with his famous orchestra, delight the patrons of Willow Grove." "Walter Damrosch, whose masterful and comprehensive interpretation of the musical classics has won such renown, and whose graceful and proficient leadership has placed him in such high favor throughout the length and breadth of the land, will again grace the music-pavilion with his famous orchestra of 50 distinguished musicians.... his interpretations appeal alike to professional and the layman in art." "When Pryor returns to Willow Grove this summer for his annual engagement, the public will have an opportunity to pass judgment on the young band-master as a composer of serious music, for during the winter months Mr. Pryor has devoted his spare moments to a style of music writing with which he has not hitherto been identified. Among the new Pryor music will be found dainty ballads, oriental dances, ballets, waltzes and soul-stirring marches that are sure to attract attention. Mr. Pryor's trombone solos will also continue to be a feature of his concerts." "Herbert Clarke will bring to the Park for an engagement of three weeks his own organization, known as Clarke's Providence Band. 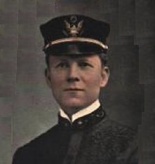 The playing of Mr. Clarke's Band in the summer of 1902 was the feature of the season. It has been strengthened by the addition of many talented musicians."